Currently, social network (SN) analysis is focused on the discovery of activity and social relationship patterns. Usually, these relationships are not easily and completely observed. Therefore, it is relevant to discover substructures and potential behavior patterns in SN. Recently, formal concept analysis (FCA) has been applied for this purpose. FCA is a concept analysis theory that identifies concept structures within a data set. The representation of SN patterns through implication rules based on FCA enables the identification of relevant substructures that cannot be easily identified. The authors’ approach considers a minimum and irreducible set of implication rules (stem base) to represent the complete set of data (activity in the network). Applying this to an SN is of interest because it can represent all the relationships using a reduced form. So, the purpose of this paper is to represent social networks through the steam base. The authors’ approach permits to analyze two-mode networks by transforming access activities of SN into a formal context. From this context, it can be extracted to a minimal set of implications applying the NextClosure algorithm, which is based on the closed sets theory that provides to extract a complete, minimal and non-redundant set of implications. Based on the minimal set, the authors analyzed the relationships between premises and their respective conclusions to find basic user behaviors. The experiments pointed out that implications, represented as a complex network, enable the identification and visualization of minimal substructures, which could not be found in two-mode network representation. The results also indicated that relations among premises and conclusions represent navigation behavior of SN functionalities. This approach enables to analyze the following behaviors: conservative, transitive, main functionalities and access time. The results also demonstrated that the relations between premises and conclusions represented the navigation behavior based on the functionalities of SN. The authors applied their approach for an SN for a relationship to explore the minimal access patterns of navigation. The authors present an FCA-based approach to obtain the minimal set of implications capable of representing the minimum structure of the users’ behavior in an SN. The paper defines and analyzes three types of rules that form the sets of implications. These types of rules define substructures of the network, the capacity of generation users’ behaviors, transitive behavior and conservative capacity when the temporal aspect is considered. As the job market has become increasingly competitive, people who are looking for a job placement have needed help to increase their competence to achieve a job position. The competence is defined by the set of skills that is necessary to execute an organizational function. In this case, it would be helpful to identify the sets of skills which is necessary to reach job positions. Currently, the on-line professional social networks are attracting the interest from people all around the world, whose their goals are oriented to business relationships. Through the available amount of information in this kind of networks it is possible to apply techniques to identify the competencies that people have developed in their career. In this scenario it has been fundamental the adoption of computational methods to solve this problem. The formal concept analysis (FCA) has been a effective technique for data analysis area, because it allows to identify conceptual structures in data sets, through conceptual lattice and implications. A specific set of implications, know as proper implications, represent the set of conditions to reach a specific goal. So, in this work, we proposed a FCA-based approach to identify and analyze the professional competence through proper implications. Acompanhe as disciplinas de Aprendizado de Máquina e Projeto Integrado em Big Data da Pós-graduação em Ciência de Dados e Big Data da PUC Minas no menu “teaching”. O que é ciência de dados? Qual o perfil e as competências do cientista envolvido nesse novo paradigma? Abstract: From the recent proliferation of online social networks, a set of specific type of social network is attracting more and more interest from people all around the world. It is professional social networks, where the users’ interest is oriented to business. The behavior analysis of this type of user can generate knowledge about competences that people have been developed in their professional career. In this scenario, and considering the available amount of information in professional social networks, it has been fundamental the adoption of effective computational methods to analyze these networks. The formal concept analysis (FCA) has been a effective technique to social network analysis (SNA), because it allows identify conceptual structures in data sets, through conceptual lattice and implication rules. Particularly, a specific set of implications rules, know as proper implications, can represent the minimum set of conditions to reach a specific goal. In this work, we proposed a FCA-based approach to identify relations among professional competences through proper implications. The experimental results, with professional profiles from LinkedIn and proper implications extracted from PropIm algorithm, shows the minimum sets of skills that is necessary to reach job positions. Silva, P., Dias, S., Brandão, W., Song, M. and Zárate, L. Formal Concept Analysis Applied to Professional Social Networks Analysis. In Proceedings of the 19th International Conference on Enterprise Information Systems (ICEIS 2017) – Volume 1, pages 123-134. ISBN: 978-989-758-247-9 Copyright © 2017 by SCITEPRESS – Science and Technology Publications, Lda. All rights reserved. Prof. Dr. Sérgio M. Dias is a Data scientist, Professor, and Researcher in Computer Science. 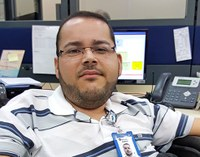 He works at Federal Service of Data Processing (SERPRO) and Pontific Catholic University of Minas Gerais (PUC Minas). He is Phd and MSc in Computer Science from Federal University of Minas Gerais (UFMG) in 2016 and 2010. B.S. degree in Computer Science from Pontific Catholic University of Minas Gerais (PUC Minas) in 2007. Research Area: Formal Concept Analysis; Neural Networks; Big Data, big Data Analytic; Data Science; Data Mining; Extract and Represent Knowledge and Machine Learning. Prof. Dr. Sérgio M. Dias Blog at WordPress.com.